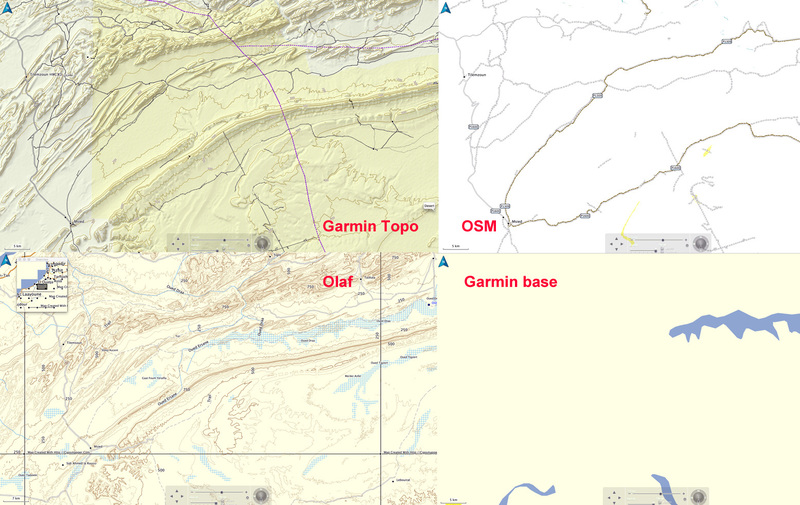 This review compares an updated Garmin’s Topo North Africa v3 Light map with easily downloaded and free OSMs, Garmin’s basic global base map and other digital maps, where available. 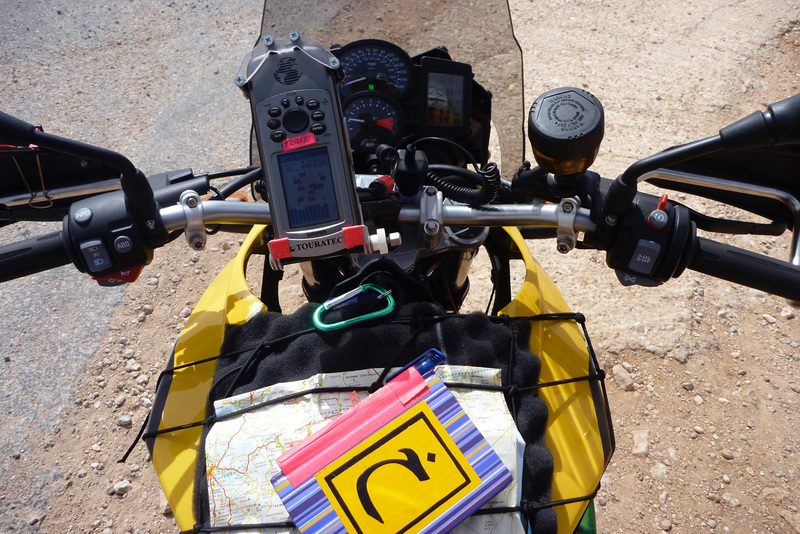 A typical handheld device like my Garmin Montana (right) has a screen a little bigger than a playing card and which is hard to read on the move – especially on a bike. 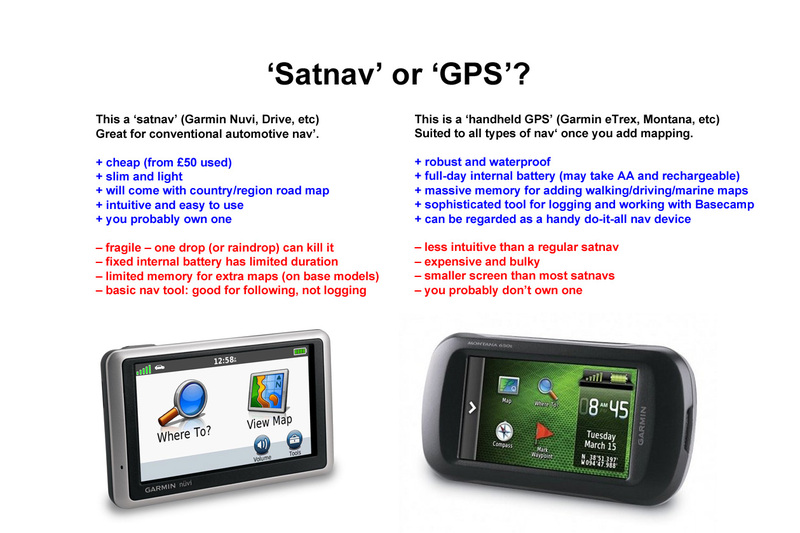 For me a ‘GPS’ (as opposed to a ‘satnav’ like a Nuvi – see below)) is best at displaying simple data like how far, how fast, how high or which way, not fine topographic detail. A paper TPC map can display six square degrees over some 18 square feet – what you call ‘the big picture’. That’s what you need travelling with a vehicle in an expansive area like a desert, while at close range concentrating on negotiating the terrain. 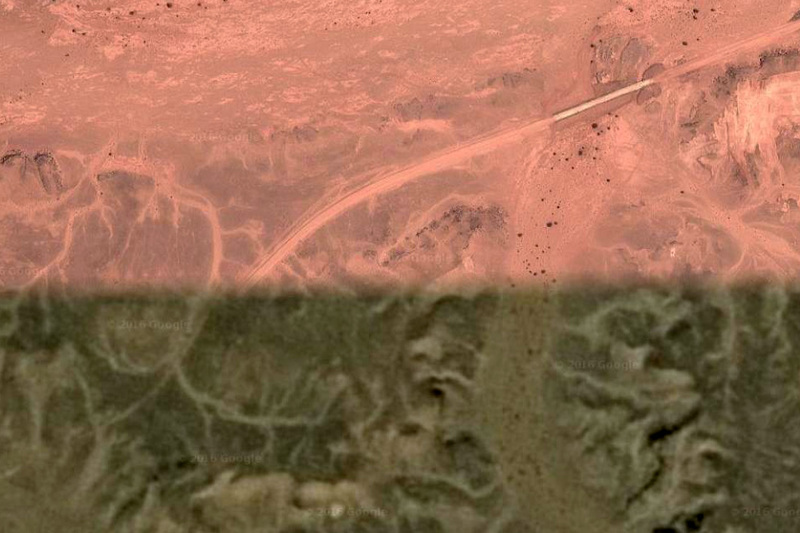 On top of excellent paper mapping (now widely digitised), we also have the wonder of Google sat imagery (among others) providing a clarity that varies from stunning (being able to follow car tracks) to a brown mush (both shown right). Google sat is great when planning, and now for a reasonable annual subscription, Garmin offer Birds Eye satellite imagery for the whole globe; the long-sought after ‘Google sat in your GPS’. With all these resources navigating in the Sahara couldn’t be easier. Even though old Olaf still measures up well, the similar topographic detail of the Garmin means it’s well worth the £20, certainly over the plainer but also free OSMs. In 2018, following a refurb/repair of my Montana, the v1 2016 version of this map was lost or could not be reloaded. I had to buy the v3 version for another £20. A quick scan shows that not much has changed, but if it has anywhere (based on OSM user updates), it will be in Morocco – the place where most users of this map will visit. 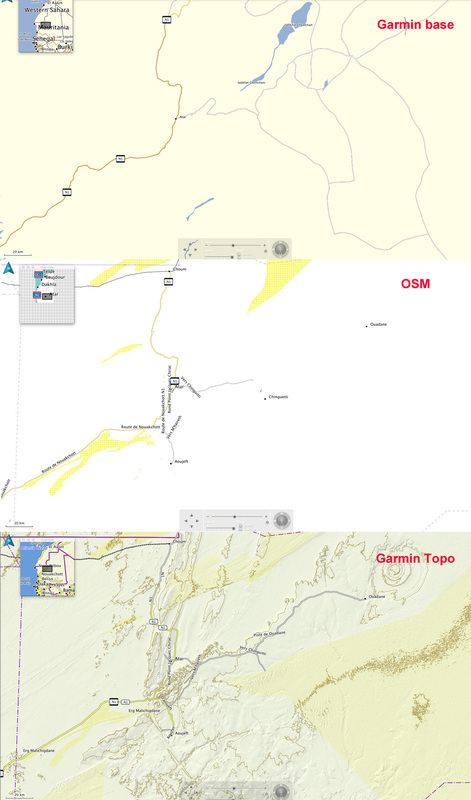 You download the Garmin Topo map directly into your device (takes about an hour) and only once your GPS is plugged into a computer, will it display on BaseCamp. 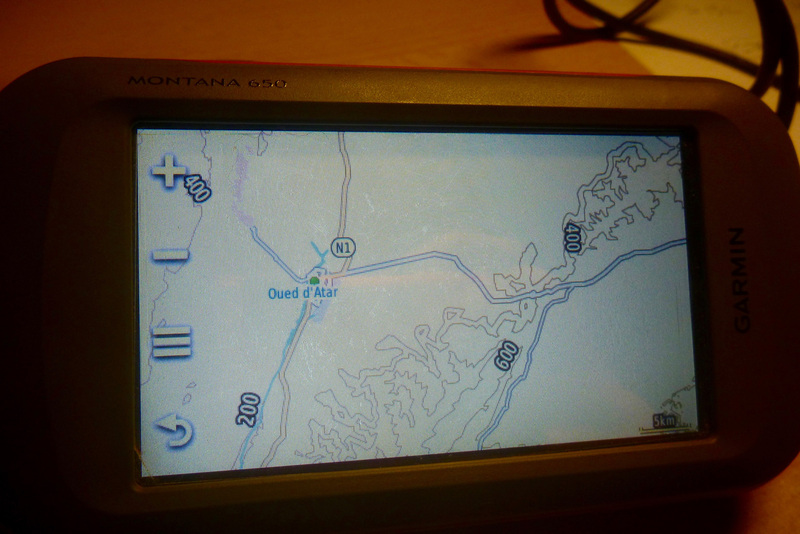 Unplug the GPS and the map disappears from BaseCamp. Switching BaseCamp between Olaf, OSMs and even the Garmin base map which comes free with a GPS unit, it soon becomes clear that the Garmin Topo has a level of detail and refinement that’s superior to the next best thing: Olaf. Occasionally at village level the OSM’s street-by-street detail is better, but that’s hardly vital. 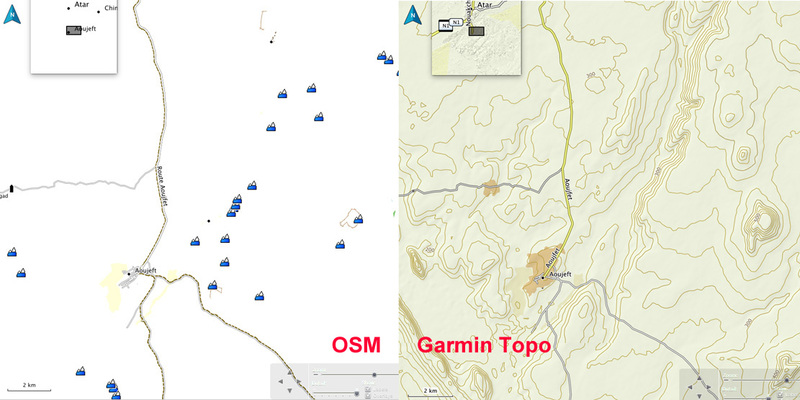 In towns and cities the extra shading distinguishes the Garmin from the plainer OSM, as shown for Tan Tan, right. The piste and road detail on the Topo is pretty good: yellow for national highways, twin lines for secondary roads or piste, and a single line for a less used piste. A quick check in Morocco shows they’re all there; most of the ones I know are there in Mauritania too. In southern Algeria only a few main pistes are shown and certain ‘national highways’ are actually remote pistes never likely to be sealed. 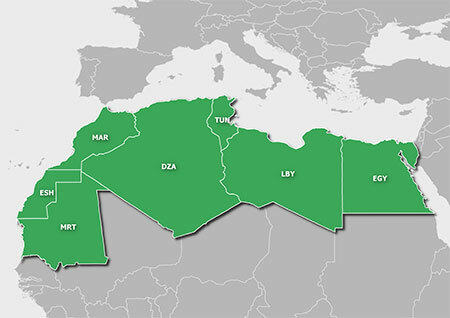 The Topo map would not be so useful here and in Libya is thinner still. In any country dashed lines may well be walking tracks, but as far as I can see, there is no key or legend with the Topo map. Some POIs are there too – just fuel stations and post offices as shown on the Tan Tan map, above. In places the Garmin copies the OSM’s annoying habit of again, marking high points (automatically?) as mountains which is a distraction, let alone inaccurate – for example when an escarpment gets shown as a string of peaks. If you drop the detail level enough notches on BaseCamp, these peaks (left) only disappear once all the useful tracks and place names have gone too. It’s great (and a bit puzzling) that this stuff is produced for free at all by OSM supporters, but the quickest flip to sat imagery would reveal the true nature of the relief. So does the Topo map mean I’ll stop using Google Earth imagery in the planning, or paper maps on the piste. I don’t think so. In places like Morocco the extent of marked pistes can be (hopefully) converted into accurate tracklogs, but with better surrounding detail than OSMs. And, unlike Olaf, there’s no aggro importing into a modern, touch-screen GPS. When I want to quickly verify where I am, a glance at the Topo map may be adequate. I’ve been using the Garmin Topo map quite heavily on Basecamp last couple of days, preparing a new edition of Morocco Overland. It’s an intuitive-reading map and I’ve found one benefit of using a Garmin map on Garmin software, is that when stringing out a track with the ‘create a route’ tool, it automatically snaps onto even the thinnest track on the map just like Google maps. But the Basecamp tool won’t do that with other installed maps like OSM or Olaf, or even the basic Garmin base map. Sometimes you have to trick the tool to go the way you want, but it makes stringing together hopefully accurate routes (as well as distances) very easy. Occasionally only Olaf will show a route you want to follow, in which case you make the route with lots of short, straight lines. No so hard. 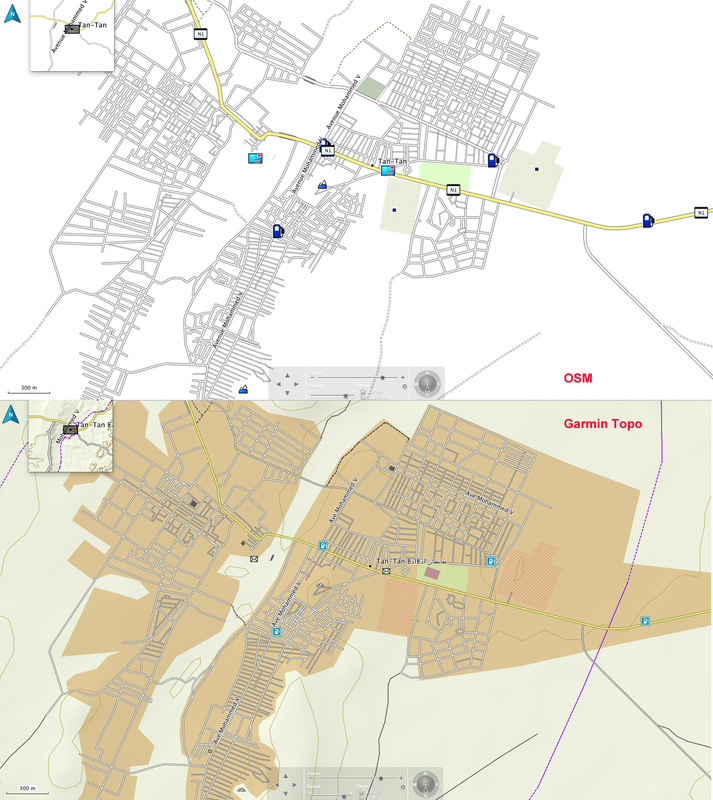 This entry was posted in Maps, Morocco Overland, Sahara book reviews, Sahara News, Uncategorized and tagged Garmin Topo North Africa Light review, OSM Sahara map review, Sahara maps on December 19, 2016 by Chris S.